The authors review multiple strategies available to reduce the negative effects of glenohumeral retroversion and/or posterior subluxation in total shoulder arthroplasty, including eccentric reaming, bone grafting, and augmented glenoid components. Total shoulder arthroplasty (TSA) has been shown to provide lasting pain relief and good long-term implant survival in many patients. Using first-generation total shoulder implants, Torchia et al [1,2] demonstrated a 93% survival rate at 10 years and an 87% survival rate at 15 years. Similarly, 83% of patients had significant pain relief after TSA. Multiple strategies can be used to reduce the negative effects of glenohumeral retroversion and/or posterior subluxation in TSA. For example, eccentric reaming, bone grafting, and augmented glenoid components are intended to allow placement of an anatomic total shoulder implant in patients with significant glenoid wear. In more severe cases of glenoid wear, the surgeon can consider 2-stage TSA with glenoid bone grafting,  the “ream and run” procedure,  or the use of a reverse total shoulder arthroplasty with a glenoid baseplate,  depending on the clinical picture and degree of bone loss. This article describes eccentric reaming, bone grafting, and augmented glenoid components in patients with glenoid bone loss who are undergoing primary anatomic TSA. Our article on managing glenoid bone loss in reverse TSA patients can be found here. Iannotti et al  also showed that correction of large deformities by eccentric reaming is difficult even in the hands of experienced surgeons: 3 of 7 cadaveric specimens with more than 10° of retroversion continued to have more than 10° of retroversion after eccentric reaming. Figure 1. Schematic showing a Walsh B2 glenoid and the difference with off-axis reaming and eccentric reaming. The glenoid is prepared by removing the labrum and any remaining articular cartilage. A guidewire is placed down the centerline of the scapula, feeling the wire barely protrude through at Matsen’s point to ensure adequate placement. A second guidewire can be used to gauge the length of the wire in the vault and confirm adequate depth. Reaming is then performed using cannulated reamers along this axis. We prefer no more than 5° of residual glenoid retroversion after reaming. The anterior aspect of the glenoid is lightly reamed, taking care to avoid complete loss of the subchondral bone under the glenoid component. The glenoid component holes can be drilled once the glenoid is properly shaped to accept an implant. Nicholson et al  reported the results of 34 patients with a minimum 2-year follow-up (mean 4.0 years) after autograft humeral head grafting during primary TSA. They found improvement in retroversion from -28° ± 4° preoperatively to -4° ± 2° postoperatively and decreased posterior subluxation. They did not revise any patients for graft collapse or component migration. After the humeral head is resected, the area that articulated with the glenoid defect is identified and selected. The graft is cut about 1-cm thick to allow it to more than fill the defect. Humeral head autograft is then placed on the glenoid and secured with 2 Kirschner wires. 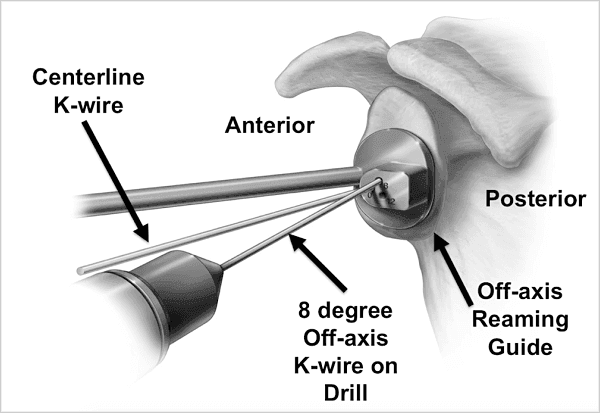 A central guidewire is placed in the standard fashion in the glenoid. The glenoid is then reamed until it is flat. Care is taken to leave the bone graft in position. Once the reaming is finished, the bone graft is affixed to the glenoid with 2 cortical screws. The implant is then inserted in standard fashion. Care is taken with the position of the screws so that a pegged glenoid can be used. If this is not possible, a keeled or in-line pegged component can be inserted instead. Since then, new implants have become available, including full-wedge (Exactech; Gainesville, Florida), hemi-wedge (Wright Medical Group; Memphis, Tennessee), and step-cut (Depuy Synthes; Raynham, Massachusetts) designs (Figure 2). Biomechanical studies have reported on theoretical advantages of each. The full-wedge design theoretically removes less bone [22, 23] and generates lower stresses at the glenoid interface  compared with the step-cut design. However, the lift-off resistance during cyclic loading has been reported to be better with step-cut designs. There are no biomechanical studies comparing the hemi-wedge design with either of the other 2 designs. Figure 2. Full-wedge 8° augmented glenoid (left), hemi-wedge augmented glenoid (center), and step-cut augmented glenoid (right). Favorito et al  reported on 22 patients who underwent glenoid augmentation with a step-cut design at a mean follow-up of 36 months. They had a 9.1% complication rate: 2 patients with postoperative instability that required further surgery. Similarly, Stephens et al  reported on 22 patients with a minimum 2-year follow-up, finding some radiolucent lines around the glenoid components but no clinical failures. Short-term results are not yet published for either of the 2 commercially available wedge designs. The 8° glenoid wedge is planned. Off-axis reaming is also planned if necessary to correct the glenoid version, including the addition of the augment to within 5 of neutral version (see Figure 1, above). Intraoperatively, the posterior augmented guide is placed on the glenoid in the standard position. The guide has 2 holes: 1 for the reaming axis and 1 for the central guidewire placement. The reaming axis pin is placed first and is placed with increased anteversion if more eccentric reaming is necessary (Figure 3). Reaming is then performed on the reaming axis pin, with the goal of minimal bone removal. With the computer navigation system used by the authors (ExactechGPS, Guided Personalized Surgery), reaming on the reaming axis can also be done without the pin. The guide is then placed on the reaming axis pin. It should lay flat against the glenoid at this point, without rocking. The central axis pin is then placed and the reaming axis pin is removed. The central hole is drilled, followed by the peripheral pegs. 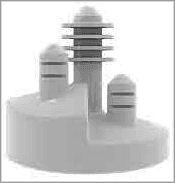 The component is placed in the standard fashion. As always, soft tissue balancing is checked. The rotator interval is partially tightened to limit posterior translation in cases with more than 50% translation of the humeral head posteriorly. Final radiographs of the full-wedge design show increased space where the posterior augmented polyethylene is thicker (Figure 4). Figure 3. Guide showing the difference between the center-line pin and the 8° off-axis pin for reaming. Figure 4. 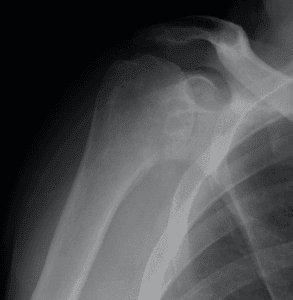 Preoperative Grashey (top left) and axillary lateral (top right) radiographs showing significant glenoid wear in a Walch B2 pattern. Postoperative Grashey (bottom left) and axillary lateral (bottom right) radiographs showing a posterior augmented cemented glenoid component (all-polyethylene cemented). This is currently available in an augmented caged glenoid. The hemi-wedge design implant has an offset reamer that is used to ream down the posterior glenoid to the desired angle (Figure 5). This allows for adequate backside contact of the glenoid component on the native glenoid. Figure 5. Offset reamer used for the hemi-wedge design. Note the second hole drilled anteriorly in the glenoid, which is needed to stabilize the reamer and to allow for reaming of the posterior half of the glenoid. Bone grafting of the glenoid with placement of a hemiarthroplasty can be performed in patients with glenoid bone stock that is insufficient for either an acute bone graft procedure with glenoid implantation or glenoid augmentation. This is not a technique we routinely use or recommend in primary TSA patients; it is more commonly used in revision shoulder procedures. A standard deltopectoral approach to the proximal humerus is performed. The humeral head is resected in the standard fashion and kept as a potential source for bone graft. The glenoid is exposed and the type of defect is classified. Impaction grafting is recommended for cavitary defects, which can be filled with corticocancellous autograft, humeral or femoral head allograft, iliac crest autograft, or a combination of these grafts. Iliac crest autograft and humeral/ femoral head allograft are preferred for rebuilding the glenoid in larger, uncontained defects. These should be affixed with at least 2 screws placed out of the way of future glenoid pegs and slightly buried, if possible. Humeral hemiarthroplasty is then performed. After at least 6 months and radiographic evidence of bony incorporation of the graft, revision to TSA can be attempted (screws can be removed if possible). CT scan should be considered to confirm graft healing to the native glenoid prior to revision with glenoid component placement. We routinely perform glenoid reaming alone in patients with minimal glenoid defects. The goal is to place an implant with less than 5° to 8° of retroversion with minimal reaming. Due to concerns for subsidence, we do not want to ream to the point at which we have reamed away the subchondral bone, leaving us with only cancellous bone at the implant interface. We do not routinely perform either autograft bone grafting of the humeral head as a single-stage or a 2-stage procedure. Although this is an option, the reported high failure rate has led us to use other techniques. In patient with a deformity, we will use an 8° posterior augment and reaming to decrease the retroversion of the glenoid. We aim for less than 10° of residual retroversion of the glenoid component, frequently using intraoperative navigation to help achieve this goal. Once again, we do not ream to the point at which we have reamed away the subchondral bone. We recommend performing a reverse TSA if there is too much residual deformity to correct the retroversion to less than 10° with reaming and augmentation, or if there is near complete posterior subluxation of the native shoulder. Many methods are available to deal with glenoid bone loss and excessive retroversion in patients undergoing primary anatomic TSA. No technique is currently without limitations. Eccentric reaming is limited to smaller defects. While bone grafting and augmentation can be used to address these defects, long-term data in many studies of bone grafting are concerning, and data have not yet been published for augmented devices. Michael Priddy, MD; Brad S. Schoch, MD; Thomas W. Wright, MD; and Joseph J. King, MD, are from the Department of Orthopaedics and Rehabilitation at the University of Florida in Gainesville. Dr. Priddy and Dr. King have no disclosures relevant to this article. Dr. Wright has disclosed that he receives royalties from and is a consultant for Exactech. Dr. Schoch has disclosed that he is a paid speaker for DJO Surgical. Torchia ME, Cofield RH, Settergren CR. 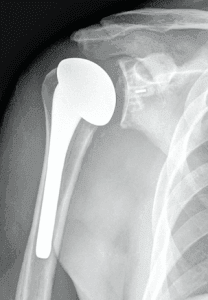 Total shoulder arthroplasty with the Neer prosthesis: long-term results. J Shoulder Elbow Surg. 1997 1997 Nov-Dec;6(6):495-505. Friedman RJ, Hawthorne KB, Genez BM. The use of computerized tomography in the measurement of glenoid version. J Bone Joint Surg Am. 1992 Aug;74(7):1032-7. Iannotti JP, Norris TR. Influence of preoperative factors on outcome of shoulder arthroplasty for glenohumeral osteoarthritis. J Bone Joint Surg Am. 2003 Feb;85-A(2):251-8. Nyffeler RW, Sheikh R, Atkinson TS, Jacob HA, Favre P, Gerber C. Effects of glenoid component version on humeral head displacement and joint reaction forces: an experimental study. J Shoulder Elbow Surg. 2006 2006 Sep-Oct;15(5):625-9. Ho JC, Sabesan VJ, Iannotti JP. 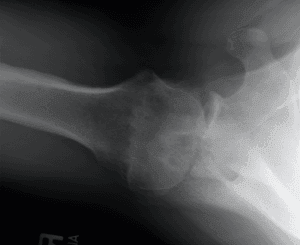 Glenoid component retroversion is associated with osteolysis. J Bone Joint Surg Am. 2013 Jun;95(12):e82. Shapiro TA, McGarry MH, Gupta R, Lee YS, Lee TQ. Biomechanical effects of glenoid retroversion in total shoulder arthroplasty. J Shoulder Elbow Surg. 2007 2007 May-Jun;16(3 Suppl):S90-5. Epub 2006/12/12. Cheung EV, Sperling JW, Cofield RH. Reimplantation of a glenoid component following component removal and allogenic bone-grafting. J Bone Joint Surg Am. 2007 Aug;89(8):1777-83. Matsen FA. The ream and run: not for every patient, every surgeon or every problem. Int Orthop. 2015 Feb;39(2):255-61. Epub 2015/01/24. Mizuno N, Denard PJ, Raiss P, Walch G. Reverse total shoulder arthroplasty for primary glenohumeral osteoarthritis in patients with a biconcave glenoid. J Bone Joint Surg Am. 2013 Jul;95(14):1297-304. Clavert P, Millett PJ, Warner JJ. Glenoid resurfacing: what are the limits to asymmetric reaming for posterior erosion? J Shoulder Elbow Surg. 2007 2007 Nov-Dec;16(6):843-8. Sabesan V, Callanan M, Sharma V, Iannotti JP. Correction of acquired glenoid bone loss in osteoarthritis with a standard versus an augmented glenoid component. J Shoulder Elbow Surg. 2014 Jul;23(7):964-73. Epub 2014/01/07. Roche CP, Diep P, Grey SG, Flurin PH. Biomechanical impact of posterior glenoid wear on anatomic total shoulder arthroplasty. Bull Hosp Jt Dis (2013). 2013;71 Suppl 2:S5-11. Walch G, Young AA, Boileau P, Loew M, Gazielly D, Molé D. Patterns of loosening of polyethylene keeled glenoid components after shoulder arthroplasty for primary osteoarthritis: results of a multicenter study with more than five years of follow-up. J Bone Joint Surg Am. 2012 Jan;94(2):145-50. Iannotti JP, Greeson C, Downing D, Sabesan V, Bryan JA. Effect of glenoid deformity on glenoid component placement in primary shoulder arthroplasty. J Shoulder Elbow Surg. 2012 Jan;21(1):48-55. Epub 2011/05/20. Neer CS, Morrison DS. Glenoid bone-grafting in total shoulder arthroplasty. J Bone Joint Surg Am. 1988 Sep;70(8):1154-62. Hill JM, Norris TR. 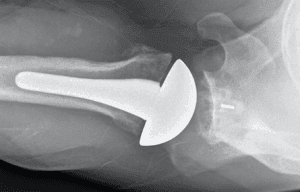 Long-term results of total shoulder arthroplasty following bone-grafting of the glenoid. J Bone Joint Surg Am. 2001 Jun;83-A(6):877-83. Klika BJ, Wooten CW, Sperling JW, Steinmann SP, Schleck CD, Harmsen WS, et al. Structural bone grafting for glenoid deficiency in primary total shoulder arthroplasty. J Shoulder Elbow Surg. 2014 Jul;23(7):1066-72. Epub 2013/12/14. Walch G, Moraga C, Young A, Castellanos-Rosas J. Results of anatomic nonconstrained prosthesis in primary osteoarthritis with biconcave glenoid. J Shoulder Elbow Surg. 2012 Nov;21(11):1526-33. Epub 2012/03/23. Nicholson GP, Cvetanovich GL, Rao AJ, O’Donnell P. Posterior glenoid bone grafting in total shoulder arthroplasty for osteoarthritis with severe posterior glenoid wear. J Shoulder Elbow Surg. 2017 May. Epub 2017/05/05. Rice RS, Sperling JW, Miletti J, Schleck C, Cofield RH. Augmented glenoid component for bone deficiency in shoulder arthroplasty. Clin Orthop Relat Res. 2008 Mar;466(3):579-83. Epub 2008/01/08. Cil A, Sperling JW, Cofield RH. Nonstandard glenoid components for bone deficiencies in shoulder arthroplasty. J Shoulder Elbow Surg. 2014 Jul;23(7):e149-57. Epub 2013/12/14. Allred JJ, Flores-Hernandez C, Hoenecke HR, D’Lima DD. Posterior augmented glenoid implants require less bone removal and generate lower stresses: a finite element analysis. J Shoulder Elbow Surg. 2016 May;25(5):823-30. Epub 2016/01/14. Kersten AD, Flores-Hernandez C, Hoenecke HR, D’Lima DD. Posterior augmented glenoid designs preserve more bone in biconcave glenoids. J Shoulder Elbow Surg. 2015 Jul;24(7):1135-41. Epub 2015/01/22. Iannotti JP, Lappin KE, Klotz CL, Reber EW, Swope SW. Liftoff resistance of augmented glenoid components during cyclic fatigue loading in the posterior-superior direction. J Shoulder Elbow Surg. 2013 Nov;22(11):1530-6. Epub 2013/03/22. Favorito PJ, Freed RJ, Passanise AM, Brown MJ. Total shoulder arthroplasty for glenohumeral arthritis associated with posterior glenoid bone loss: results of an all-polyethylene, posteriorly augmented glenoid component. J Shoulder Elbow Surg. 2016 Oct;25(10):1681-9. Epub 2016/05/17. Stephens SP, Spencer EE, Wirth MA. Radiographic results of augmented all-polyethylene glenoids in the presence of posterior glenoid bone loss during total shoulder arthroplasty. J Shoulder Elbow Surg. 2017 May;26(5):798-803. Epub 2016/11/22.